Explore the Mediterranean, the Caribbean or the Atlantic on board the beauty that is the Norwegian Spirit. Relax and enjoy everything the ship has to offer. The Norwegian Spirit has something for all the family to make their cruise holiday truly special. With a range of spacious staterooms to suit even the most luxurious taste, you’ll be sure to remember your stay onboard this spectacular Norwegian Cruise Line ship. Fill your days at sea with action packed activities at Buccaneer's Wet & Wild pool or find some me time at the Mandara Spa. With the kids at the Celebrity Teen Disco, enjoy the views from the Galaxy of the Stars Observation Deck. Enjoy a relaxing meal at one of the top-class speciality dining options from flavours of the Tuscan countryside at La Trattoria to Flying shrimp at Teppanyaki. After you’ve treated your tastebuds, experience ELEMENTS!, an incredible visual production revelling in the four elements of the Earth. If you’re feeling lucky, venture into Maharajah’s Casino bar and try your hand at some Vegas style games. There are endless opportunities to have fun and create memories onboard the Norwegian Spirit, while cruising across the Mediterranean, the Caribbean and the Atlantic. 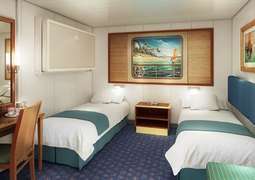 All cabins on board the Norwegian Spirit provide you with a stylish and comfortable place to call home as you cruise. 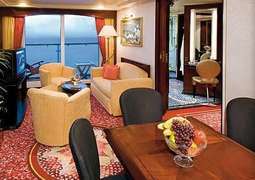 You will find all you need to enjoy your cruise in your cabin, from the basics in the cosy single cabins to the luxurious suites on board. 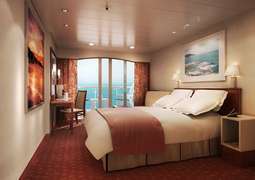 Choose any one of the balcony cabins available to have your own personal space, complete with furniture to enjoy the scenic views as you cruise. A spacious and elegant choice is a suite, which feature a living area to relax in, large balcony, private butler service and whirlpool bath for ultimate relaxation. 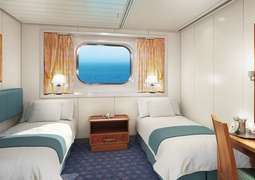 With a wide range of staterooms on board you are sure to find one that suits your taste and budget. With a huge variety of different dining options and restaurants available to passengers, all tastes and preferences are catered for. For a taste of Italy the chic Italian eatery 'La Trattoria' is the place to go, with a range of pasta dishes prepared with the freshest ingredients. There are plenty of casual dining options on board, from the 'Bier Garten Grill' serving up German favourites to the 24-hour 'Blue Lagoon Cafe' making sure you can always enjoy your favourite dishes in a family friendly atmosphere. The two main dining rooms 'The Garden Room' and 'Windows' couple a delicious five-course menu with an intimate atmosphere, great service and beautiful panoramic views. There is plenty on board to keep you enjoying every moment of your cruise. The shows on board are sure to mesmerise and excite, with the Norwegian Cruise Line's show 'Elements' providing plenty of magic, music and dancing while the show 'World Beat' will take you on a worldwide musical discovery from the comfort of the on board theatre. You will find the ideal spot to share a few drinks with friends in one of the various bars or lounges like 'Henry's Pub', the 'Shanghai Bar' or 'Champagne Charlie's Champagne Bar'. For passengers who enjoy to party, 'Soul Rockin' Nights' will have you dancing the night away to some of the best of folk, country and 80's power rock. A range of facilities and amenities on board are waiting for you to keep your body and mind in top condition. Those who like to keep active will enjoy the facilities available at the Mandara Spa & Fitness Centre, where a range of exercise machines can be found as well as a wide range of rejuvenating spa treatments. The Tivoli Pool is the main pool on board and is an ideal location to enjoy a swim. Younger passengers will enjoy Buccaneer's Wet & Wild and the Celebrity Teen Disco which are sure to keep them entertained.